This is the third and final “audio letter” that I created as a reader response to Participatory Culture in a Networked Era. The letters use a quote from the three writers of the book as an inroad to a reflective response. The first audio was to Henry Jenkins. The second, to danah boyd. And this one is to Mimi Ito. Yesterday, I posted an audio letter to Henry Jenkins inspired by Chapter Four of Participatory Culture in a Networked Era as part of a slow-read with Digital Writing Month folks. Today, I want to share my letter to co-writer danah boyd (tomorrow or Wednesday, I will share out my letter to the third writer, Mimi Ito). The theme of the chapter was Learning and Literacy. After finishing up Chapter 4 in Participatory Culture in a Networked Era as part of a slow-read with Digital Writing Month folks, I felt this impulse to respond in voice to the three writers as they talked through complex issues of learning and literacy.That led to the idea of three “audio letters” to the writers — Henry Jenkins, Mimi Ito and danah boyd — and the first is here, to Henry. I took a quote from the chapter and built my response around the ideas in the quote. I’ll share out my audio letters to Mimi and danah in the next two days. Digital Access and Equity: What if THEY is all of US? I am in the midst of reading Participatory Culture in a Networked Era with the Digital Writing Month community and thoroughly enjoying the format (discussions among Ito, boyd and Jenkins) and the topics, which connect nicely to my own diving into Connected Learning. Chapter Three of the book centers on access and equity issues (under the academic guise of “genres” — at least, in my mind) and as I was reading, this comic began to form in my mind. It’s a bit metaphorically simple: the locked door and no access to the inside from those on the outside. But it was tagline that seemed most important to me: What if they is all of us? 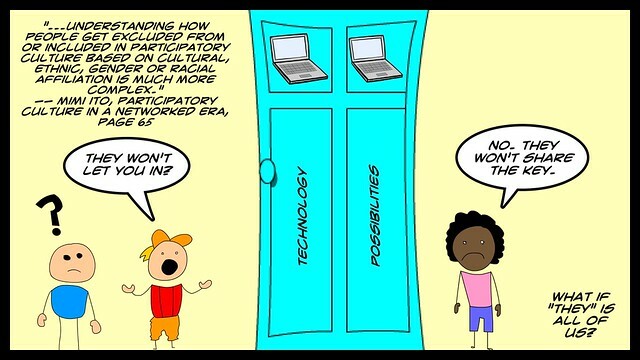 What if we (us teachers, us adults, us) are the ones closing that door on different elements of our population? 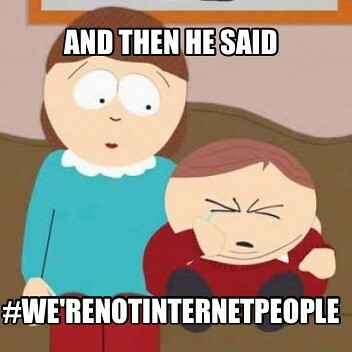 What if we are doing it inadvertently? What if we don’t even know the door has been closed? Who’s waiting out there, wondering? And then, of course, the ancillary question: how do we break that door open wide so no one feels left out? Pass me that sledgehammer won’t you? 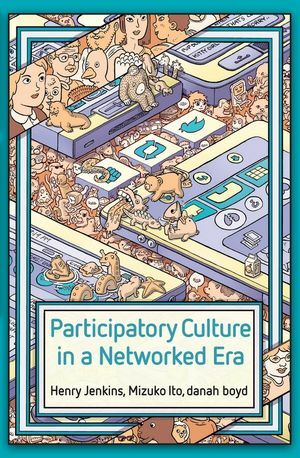 There has not been a whole ton of interacting itself for our slow-read book talk on Participatory Culture in a Networked Era. Folks are still getting the book, or recovering from the holidays, or just plain ol’ busy in their lives. But that hasn’t stopped Terry Elliott and myself (mostly Terry) from trying to encourage open participation along many different sites and technology platforms. Mostly, this is because no single experience captures the kinds of participatory activity we envision for a book talk. But also, this is because exploration and dispersion of ideas is part of the experience itself. We don’t want ideas confined to one space. But there is the danger of too much dispersion of interaction, too, and the worry is that all will be lost in the haze of connections. Or, that someone entering now will think, I’ve missed it all and don’t know where to begin. We can say “there is no fixed beginning point” all we want, but we need to show that and keep the invitations open. Terry is working on a place where links to all of these discussions can be had for anyone just entering the discussions or interested in what’s going on. What I realized as I was putting the chart together is that it is not easy to keep something like a slow-read book talk moving forward over weeks and months time. Momentum gets lost rather quickly. Maybe our aim to build a participatory culture experience around a book about participatory culture ideas won’t quite work. If all of the energy falls to the organizers, is it truly participatory? Don’t know. Prob not. What you get then is a small book group or conversation, not a participatory experience. It’s worth trying, though. It’s always worth trying. Me? I aim to keep reading and reflecting on it all, as best as I can. I am finding the book useful and the authors interesting, and I look forward to what others are noting and observing. You’re invited, too. Of course, you are invited. 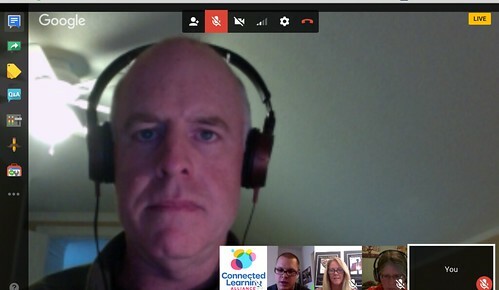 We’re on Twitter with the #digiwrimo hashtag. 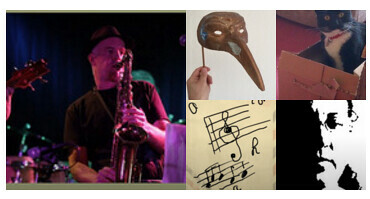 And in the Digital Writing Month Google Plus community. Folks are annotating with the Kindle app in Amazon. Goodreads is another place for notes and reactions (here are my notes). Blogs are another means of book talk writing. Heck, send notes as smoke signals. We’ll find a way to see them and connect. 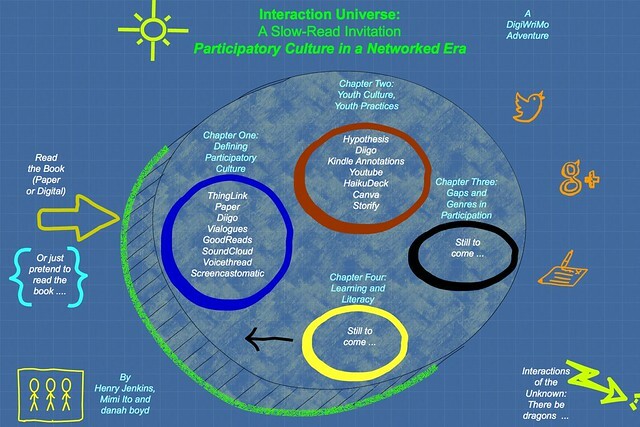 The second chapter of Participatory Culture in a Networked Era is a fascinating discussion and inquiry in ways in which youths use technology and digital media on their own terms, and I appreciate that Ito, boyd and Jenkins tear into the notion of a Digital Immigrant/Digital Native divide. I hope we can all agree by now that such a dichotomy is too simplistic to be of any value. I went back to my highlighted notes and pulled out some quotes that I like from the three researchers in their discussions, and put them into Haiku Deck for a visual tour of the chapter. I am fortunate. I have friends who are willing to collaborate with me, and it doesn’t matter where on the globe they live. We connect and create, regardless of time zones and languages. This was once again made clear to me over the past two weeks when I recorded a song that I had written a few years ago, moved it into Soundtrap, and began inviting folks to sing along with me on the chorus. The song — All Join Hands — is a response to the violence in the world, a pushing back against discord. An acknowledgement that we need to help those in need, and that we all have an obligation to each other. We all need to join hands. So, out went the invites, asking for voices, and in came the amazing array of sounds as Ron, Sarah, Maha A., and Wendy all lent me a gift that we wove together for this version of the song. Thank you, friends. Thank you for taking the time to sing with me. Thank you for honoring the lyrics with your voices and passions and melodies. Thank you for connecting with me, again, and reminding me of the power of those connections. We’re just launching our #DigiWriMo slow-read of the new book — Participatory Culture in a Networked Era — by eminent scholars Henry Jenkins, Mimi Ito and danah boyd. Terry Elliott has set forth a few collaborative annotation options for people to feed into as a way to demonstrate participatory culture as a shared reading experience. I hope we begin to examine how technology platforms promote and/or hinder participatory involvement. After reading the first section — which is, as the rest of the book, mostly in the form of a transcribed/edited conversation between the boyd, Ito and Jenkins — I was struck by a number of phrases and ideas. My highlighter (I am reading paper copy of book) had been busy, and as I looked over my notes, I began to see a found poem taking shape. 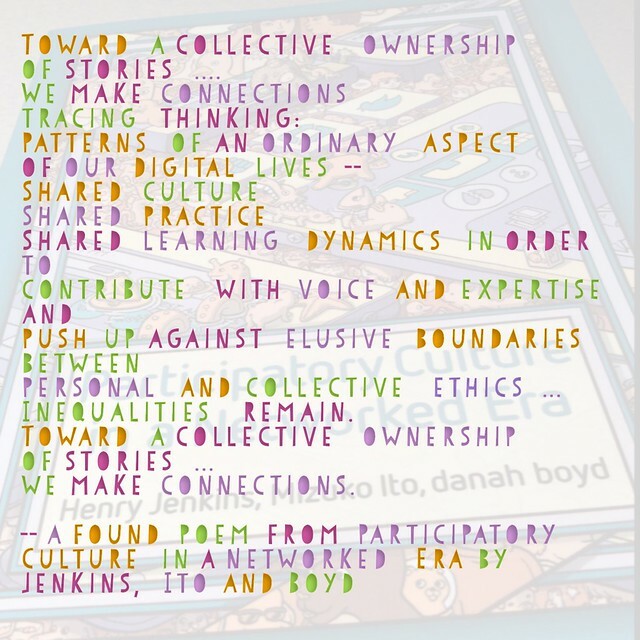 The phrase “Toward a collective ownership of stories” keep ringing around in my mind. This phrase resonated with me and all of the collaborative projects that we undertake in places like #DigiWrimo or #CLMOOC or #Rhizo(add year) or whatever. While the platforms of technology open up possibilities, it is always the people that make the collaborations happen. We tell stories, together. I am making connections between that work/play and what the three writers here are talking about when it comes to participatory culture. Those words in the text became the anchor point for a found poem. I had this vision of doing it as a podcast, and trying to get many people to read that line “Toward a collective ownership of stories” together, as a chorus. I might still try that, but I have been swamped and I know others are, too. You are invited to slow-read this book with us, too. This slow-reading idea means we are not in any rush. The discussions will probably unfold over a few weeks, right into and through the new year. People will get their books when they can. Semesters need to end. The holidays need to pass. We’re starting but there is no real starting point. Some of what we will do will be in our DigiWriMo Google Community. Some will be via the Twitter hashtag of #digiwrimo. Some will be at your blog. Or my blog. Some may unfold in Facebook. Some will take place who knows where. That’s good. That’s fine. We like that. Disperse your ideas in ways that help you move forward.